Today, 20 January 2015, marks the 750th anniversary of the first parliament of elected representatives at Westminster, the de Montfort Parliament. The BBC have called it Democracy Day and are running a day of programmes to celebrate. In celebration of Democracy Day I wanted to share with you some of my collection of antique suffragette postcards. These little 6×4 cards are a reminder of how far democracy has come in the last century. The most valuable postcards are the ones of photographs of famous suffragettes. But those aren’t my favourites. 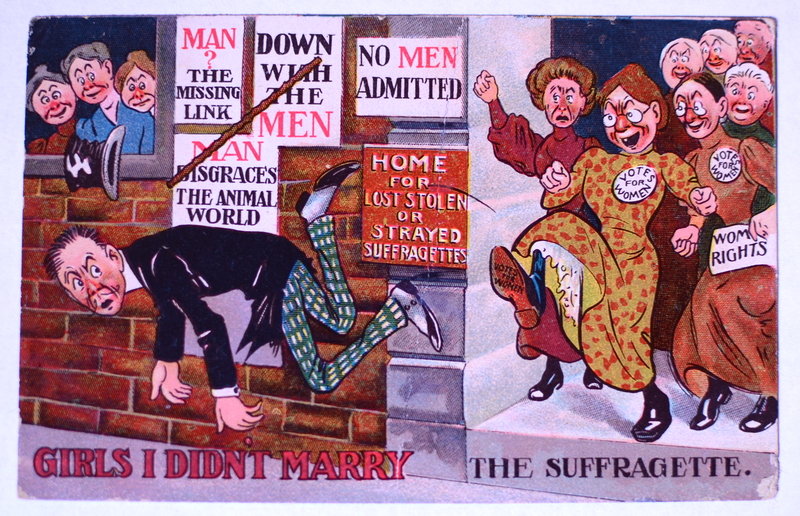 My favourites are the humorous cartoons from the anti-suffragette movement. Women campaigning for the vote were often drawn as drab, ugly and old. The message was, if you want to vote you’ll never find a husband, as per the example below. This weekend I discovered a vintage paper fair on in San Francisco and at the fair I found my first anti-suffragette postcards published in the USA. I got a bit excited, splashed out and bought three! 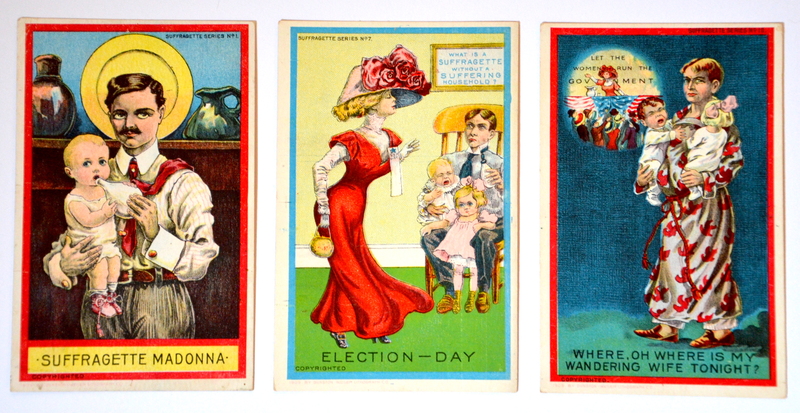 Like the British postcards, they depict the grave consequences of women having the vote. There are numerous images of men sitting in a chaotic household, left holding the baby. One goes as far as to suggest that a man looking after his child is akin to the Madonna. Today the messages of the cartoons are quaintly amusing. And even though we’ve far to go on the issues of women’s rights and equality, these postcards are a reminder that we’ve come along way baby.